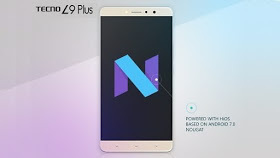 Android Nougat 7.0 is currently hitting Tecno L9 Plus. As usual, the update is arriving via OTA (Over-The-Air), and comes with cool features and system enhancement. The Tecno L9 Plus was launched early 2017 with awesome specifications and features. In fact, it's the first series of smartphone launched by the company this year after its predecessor Tecno L8. The update is being rolled out to all Tecno L9 Plus users. If you use one, you should receive an OTA notification of Android Nougat update. The update weighs in at about 735MB. After upgrading, you will be presented with a new classic interface and exclusive features that will definitely make you smile. >> Upgrade from Marshmallow to Nougat. >> Transfer, Scan charge and Hi Theme added. >> Issue where the decimal point could not be input when entering the second numerical value with the decimal point fixed successfully. >> Fixed the issue where the wallpaper in the standby disappeared when cleared with the weather data and tapped the Home button back to the standby interface. >> Fixed the issue where the contacts could not be added when entered SMS for the first time, edited new message and added contacts. >> System and performance stability optimized while fixing other issues. >> Go to "Settings" from your phone. >> Scroll down and tap on "About phone". >> Then, tap on " System Updates ". >> Finally, tap on "Download and Install"
>> After that, tap on "Install"
>> Your phone will be rebooted. Yeah! You should see the new update smiling at your face after the reboot. NOTE: Make sure you unroot your phone if it's rooted before proceeding with the update, so to avoid bricking your device. Do you use this device? Have you upgraded to Android 7 Nougat? Let's hear you via the comment box below. I thought this came by default on the phone. Am I missing something? 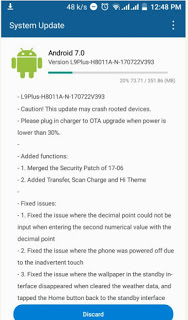 Clement you absolutely right sir Tecno L9 plus comes with nougaut otb,so I guess Kachi made a mistake he would have simply clarified that this update it's just a normal update to fix erors and besides the update size is too small for a full nougat update.its quite obvious..We normally gets such updates time to time it's not a major Android nougat update..
What of Tecno L8 lite?